This week, we cover the story and legacy of the great warrior Kusunoki Masashige. 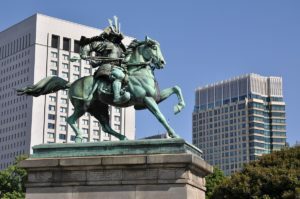 Why does he have the unique distinction of a statue on the grounds of the emperor’s palace in Tokyo? What do we actually know about him? The Siege of Chihaya, as depicted in an Edo period print by Ichijusai Yoshikazu. Despite his ultimate defeat, Masashige’s stand here was the start of his legend as a valiant warleader. 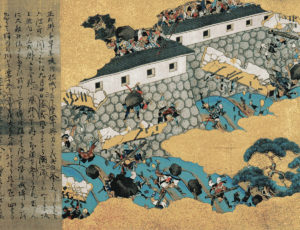 The siege of Akasaka Castle. The battle of Minatogawa, by Utagawa Kuniyoshi. 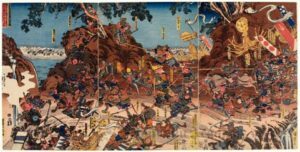 Another scene from Utagawa’s rendering of the battle of Minatogawa. Very interesting episode, it is fun how a statue can tell a story connecting the end of Kamakura and Meiji and even WW2. First, it is MasaSHige, not MasaHige. Second, you say that it is characters for “tree” and “self” combined that make the character for “camphor tree”. Actually, it is “tree” and “south”. Aaah, good catch. Looks like I made a transliteration error in my notes and then just never fixed it during the research process. It’s fixed in the show notes, and a fixed .mp3 file is uploading as we speak. Thanks! Never mind the second correction. I don’t know why I heard self there.